This Genetic Genealogy Ireland website came into existence in July 2013 and over the course of these past 3 years it has attracted quite a bit of traffic. Below is a break down of the metrics associated with this website and the associated Genetic Genealogy Ireland YouTube Channel. Both sets of metrics use Google Analytics. How much traffic is the website getting? So far, the website has been viewed more than 130,000 times. Because the Genetic Genealogy Ireland conference occurs each October, the highest volume of traffic to the website occurs in the few months prior to this time. This is also the time when most of the blog posts are posted. October is the peak month for traffic with 6000 views in October 2013, 13,000 in October 2014 and 10,000 in October 2015. But even during its quiet time, the blog attracts about 100 views each day. 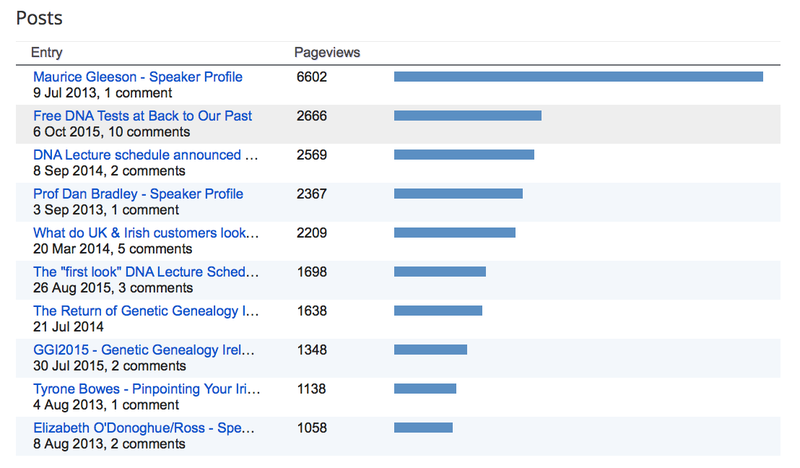 Who is the audience for Genetic Genealogy Ireland? Ireland is the country with the second highest number of views, so clearly the website is reaching both Local Irish and Diaspora Irish. The UK comes in third with 13,000 views. And again, this comes as no surprise given that up to 25% of the population are thought to have Irish ancestry. That's about 15 million people. The big surprise in the country list is Russia, which comes in fourth place, and to an extent France as well, which is placed fifth. Why the Russians are interested in Irish genealogy I don't know, but all I can say is "Radushnyye, tovarishchi! Vse zhelayushchiye" (and hope that Google translator is working properly). And while I'm at it, I might as well add "Bienvenue à tout le mode!" Maybe there are a lot of recent Irish emigrants in Russia and France. The same reasoning may apply to Germany and Ukraine, and even South Korea (placed 7th, 8th & 10th respectively). So, the appearance (and rank order) of the English-speaking countries in the list comes as no surprise, but it is the popularity of the website in the non-English-speaking countries that gives one pause for thought. 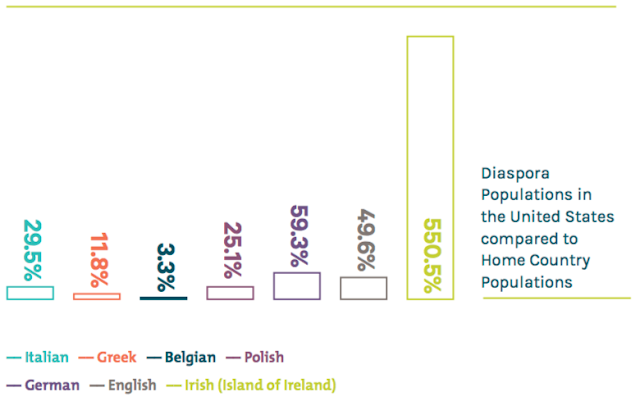 Maybe the Irish diaspora is more widespread in these countries than "official figures" might suggest. 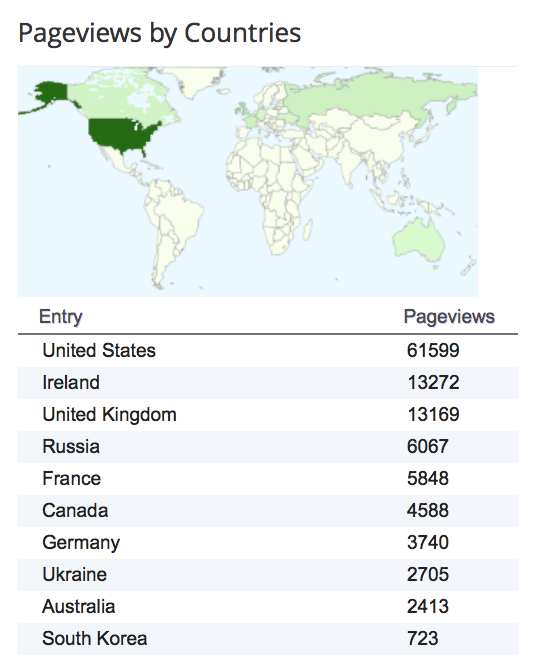 Either way, it is clear that the Genetic Genealogy Ireland website is reaching a substantial international audience. How do people arrive at the website? Most of the referrals to the website come from Facebook. As each new blog post is issued, announcements of its publication are made on a variety of different Facebook pages, including the associated Genetic Genealogy Ireland Facebook group (current membership 2600). This is the main form of active promotion of the website and its blog posts. The four main Facebook sources account for over 16,000 referrals. The second greatest source of referrals is Google (>10,000 in total), the website itself (2700) and the Back to Our Past website (1000) where there are links to the GGI website and the schedule of DNA Lectures. What are the most popular Pages & Posts? Next to my own Speaker Profile page (I knew I wasn't being paranoid), the most popular post relates to the Free DNA Tests. Yes, people will always like free things, even me. Only yesterday I got some free cat food - "Buy One, Get Two Free" - I couldn't resist! Now I need to buy a cat. Another popular post was an analysis of the type of customer who bought DNA kits at Back to Our Past 2013 in comparison to those at Who Do You Think You Are 2014. 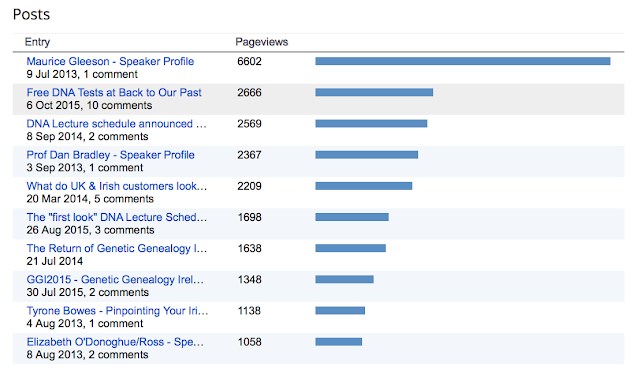 And the announcement of the DNA Lecture schedule for each year understandably attracts a lot of traffic. We need to bear in mind that some post have been up for much longer than others so these figures will be skewed. 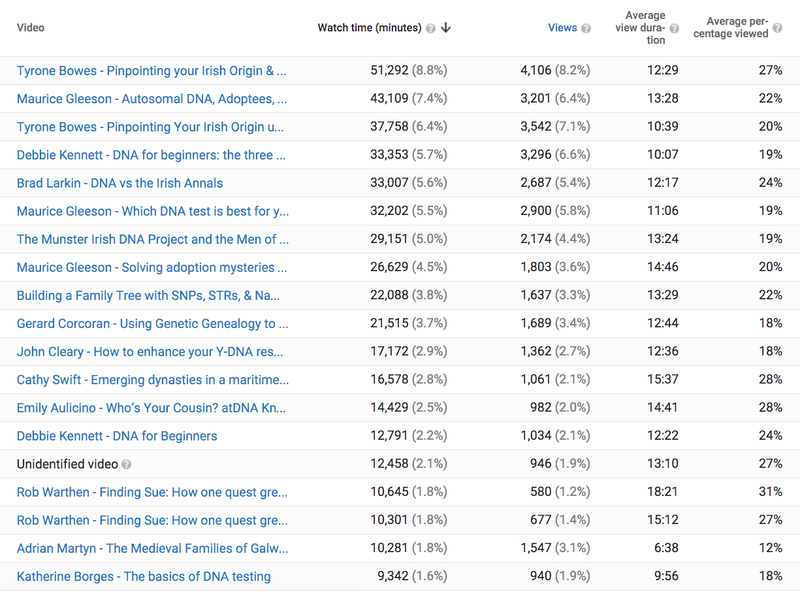 In terms of Pages (the more static parts of the website), again Free DNA Tests was the most popular, accounting for about 50% of the views in this section. Other popular Pages were the short guide to Finding Your Irish Ancestors and Which DNA Test is Best for You? Let's turn our attention now to the Genetic Genealogy Ireland YouTube Channel and examine the metrics there. How much traffic is the YouTube Channel getting? The YouTube Channel consists of 14 videos from the 2013 conference, 17 videos from the 2014 conference, and 14 from the 2015 conference. Altogether, the channel has been viewed over 49,000 times for a total of almost 586,000 minutes. That translates into 1 year and 41 days of continuous viewing. Viewing has tended to peak immediately after the October conference as the new videos are uploaded to the Channel and people who have not been able to attend the conference in person can view them for free in the comfort of their own homes. Interestingly, for the rest of the year, until the next conference, the average daily viewing time was about 2-3 hours in 2014, 8-10 hours daily in 2015, and 18-20 hours daily in 2016 (thus far), so the channel is clearly growing in popularity as more videos are being added and news of its presence spreads. The YouTube Channel has 356 Likes, 123 Comments, 212 Shares, and the videos were added to viewer's playlists 770 times since October 2014. It's popular! Most of the videos (85%) are watched directly on the YouTube website, but 15% of them are viewed on other websites where they have been embedded. Most people watch the videos on their computer (71%), 13% watch them on a tablet (like an iPad), 8% watch them on their phone, and 6% watch them on their TV. Who is the audience for the YouTube Channel? Well the first thing to note about the audience figures is that Russia does not even feature and France is 9th. Not a bad placing for France, but why was the GGI website so popular in Russia but not the GGI YouTube channel? I think there may have been a Russian robot somewhere climbing over the webpages, but for what purpose I do not know. In fact, I seem to remember some strange traffic from Russia back in 2014. This changes the order of the countries and gives us an idea of how popular the videos are in each country. With this new metric, Ireland comes first, followed by the next 4 countries in almost joint second place (Canada, New Zealand, US & Australia). The UK comes in 6th place which is a bit surprising, all the moreso when one considers that the population of Northern Ireland is probably included in the viewing figures for the UK (it's difficult to be certain of this). What isn't a surprise is that English-speaking countries are in the first 6 positions, but these are followed by Germany, Sweden, France and Mexico, so there is still evidence of a reach into non-Anglophone countries. And this suggests that there is a customer need and desire for video presentations on genetic genealogy in general (as well as, perhaps, Irish genetic genealogy in particular) and that this need extends far beyond the normal bounds of what one might expect. Either way, it is very encouraging to see that the videos from Genetic Genealogy Ireland are helping to fill that educational gap and satisfy that customer need. What are the demographics of the YouTube audience? Even though genealogy is predominantly a female pastime (a hobby practiced by woman of a certain age?) there is a preponderance of men watching the videos. Maybe women like to pick up a book, and men prefer to plonk down in front of a screen ... hmph! Typical! This gender difference is more pronounced in certain countries, such as Ireland, Sweden, Germany & the Netherlands where the percentage of male viewers is 73%, 78%, 91% and 93% respectively. There is a much greater proportion of younger men than younger women watching the videos. In fact, 15% of viewers are under the age of 35, and there are even a few teenagers in there too. It's nice to see there is growing interest in genealogy from a younger audience - we are encouraging the genealogists of tomorrow! What are the most popular videos? I know ... this is the moment you have all been waiting for. Well, I need to temper your expectations. We have to bear in mind that some of the videos have been up for 2.25 years, others for 1.25 years, and the last batch for only 0.25 years (if that), so this will have an obvious effect on viewing figures. Ideally, we should divide the viewing numbers by the time they have been up on YouTube to make it an even playing field (so to speak). So for what they're worth, here are the videos that currently have the most views. There are no Oscars or Golden Globes here - everyone's a winner. Genetic Genealogy Ireland has certainly surpassed my expectations since it was set up 3 years ago. I thank the day that Derrell Oakley Teat emailed me and said "Let's ask FamilyTreeDNA to sponsor a stand at Back to Our Past so we can sell DNA kits in Dublin!" If it wasn't for Derrell's idea, none of this would have come to pass. But it did. And now we have a great conference, with excellent topics and speakers, that champions genetic genealogy, particularly among those with Irish ancestry, and that we can share with the rest of the world by making full use of the internet and social media. 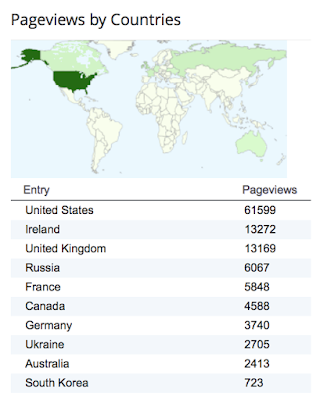 And from the above metrics, it is evident that GGI has a reach that extends to both Local Irish and Diaspora Irish alike, wherever in the world they may be. 1. Ireland's Diaspora Policy. Dept of Foreign Affairs & Trade. March 2015. 2. Countries in the world by population (2016). Are you able to distinguish between human visitors and bots/crawlers? It could explain the Russian *visits*. Apparently Google Analytics filter out any "bots", at least for the YouTube analyses. Maurice, A very interesting review. Great insights to how many and who has been able to take advantage of this great resource. I appreciate having the resource to refer to people interested in learning more. Look forward to Back to Our Past 2016. Maurice: Pleased to see Canadians viewing on YouTube. Will you do a similar analysis for the WDYTYA? Live videos? Very interesting data, Maurice. But, em, what is a 'woman of a certain age'?? And do "men of a certain age' also exist?? I've been researching my genealogy since I was 12 years old - is that 'a certain age'?